How can I get more fiber into my daughter’s diet? There are many kid friendly sources of fiber. Fruits (including dried fruits) and veggies are good sources of fiber, especially those with seeds (like blueberries). The bulk of the fiber is in their skins. Bran, peas and lentils are classic good fiber sources as well. My children enjoy bran muffins and a lentil bean soup. Probably the biggest sneaker source of fiber is popcorn. 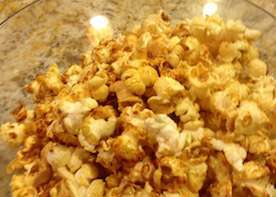 Serving popcorn without butter is a great way to increase a child’s dietary fiber. Popcorn and raisins can be chokables and should be reserved for seated children two and up.